Aromatic Bliss at its best! Words cannot describe the feeling I left with from the 2018 NAHA World of Aromatherapy Conference. It was incredibly refueling, inspiring, empowering, motivating and elating to be in such extraordinary company of so many aromatherapy veterans, “rockstars” (or “scentstars” as I call them) and newly passionate aromatherapists. The energy was enlivening and the camaraderie was infectious. All I can say, is WOW! I can’t wait for the next one in 2020. Well, let me not get ahead of myself. First, I want to share my experience with you from the perspective of the event emcee, attendee, speaker, vendor and sponsor. It was humbling to experience so much kindness among our aromatic community. People helping people; sharing ideas and mentoring tips. Encouraging one another and giving insight into a niche aromatherapy topic to enhance someone’s life. Pure brilliance. The caliber of speakers, topics, vendors and sponsors far surpassed any other conference I have experienced before. Whether you are an aromatherapy beginner, professional or advanced practitioner, there was something for everyone. Each day began with a community breakfast, fruit juice, coffee and tea. Aromatherapists from all over the world gathered and filled the dining area to network and mingle. This was a great time to meet new people, build friendships and cultivate existing ones. After breakfast, it was off to visit the vendors at the aromatherapy tradeshow. You could smell the aromatic scents emanating throughout the halls, rooms and common areas. A garden for the senses. So many essential oils, aromatherapy accessories, latest technology and software, distillations, hydrosols, botanical creams, animal aromatherapy, testing companies, researchers and aromatherapy education. Speakers began presenting around 9:00am and continued throughout the day until about 9:00pm. Don’t worry, we had several breaks in between that time. We had a community lunch and dinner that allowed more opportunity to mingle and network. An evening social and dance. It was like spending time at a family reunion, with people that you love and admire. The conference was overflowing with knowledge, wisdom and expertise in just about every genre of natural health. Speakers from around the world shared their work, research and experiences. It was very insightful to see what aromatherapists are doing in other countries and in various settings. From children to seniors, humans and pets, to the trees and farms. Learning from aromatherapy veterans who I have looked up to ever since I was introduced to aromatherapy was everything I had hoped for. Here are my highlights. If any of these speakers or topics are of interest to you, or you want to hear this same information from the speakers themselves, great news…it was all recorded. You can purchase the whole conference or individual sessions at https://naha.org/bookstore/2018-confer. Amanda Plunkett – The Olfactory System and Autoimmunity: It was great hearing Amanda’s personal story and triumph of helping herself through serious autoimmune issues. She shared her journey, remedies and a greater understanding of the olfactory system’s role with overall heath. Hearing her insight about the liver, lymph, endocrine system, adrenals and nervous system, really had lightbulbs going off in my head of how I can help my self and my clients. Jessie Hawkins, PhD – Essential Oils to Address Fatigue among Women with Hypothyroidism: Who knew research could be so cool. It was great to hear how research works, all of the details that go into a research study, why it is important and how results are determined. She shared particular studies with us from start to finish, along with methodology and wellness results. Loved hearing her talk. Joy Bowles, PhD (Keynote Speaker) – Is Aromatherapy all in the mind? Current research on the psychological, cognitive, and neurochemical effects of essential oils and their constituents: Such a ball of energy, light and inspiration. Joy talked about neurochemistry and its effect on cognitive functions and dysfunctions (such as Alzheimer’s), and how aromatherapy can help bring harmony and balance to the mind. Joy also did a post-conference workshop. Madeleine Kerkhof – Fusion AromaTherapy™ for mouth care in oncology and palliative care: Every time I hear Madeleine speak, I truly feel her heart. She is passionate about what she does, so kind and compassionate and has so much insight into integrating aromatherapy into palliative care. She shared which essential oils and botanicals were most beneficial for certain health issues. She also taught a post-conference that I was a part of, and it was a great way to end my conference experience. It restored my heart and fueled my mind. Marco Valussi – Coevolution, taste, and olfaction, and essential oils’ chemical features: What do they tell us about essential oils and aromatic plant’s potential? : Such an advanced talk, learning about the evolution of plants, why they function the way they do and how they function in certain situations. As deep of a conversation and discussion as it was, I was inspired to think on a much deeper level about connecting plant with people to accomplish health goals. To be a good practitioner, and aromatherapist, we need to understand the “hows” in order to apply them to the “whats”. Farida Irani – Oiling the 10 gates and the benefits of clinical Ayurveda aromatherapy for chronic diseases: A beautiful woman, inside and out. I met Farida for the first time in 2006 at the NAHA Aromatherapy Conference in Boston. Such a delight and great introduction for me to Ayurveda aromatherapy. This year, she shared more insight of how to implement Ayurveda practices for chronic issues. Salvatore Battaglia – The role of scent in culture and spiritual practices, and how this has helped establish a framework for the practice of aromatherapy today & The Role of Science in Aromatherapy: One of my all time favorite aromatherapy idols. I have used his book since I began in aromatherapy and it has served as my “aromatherapy bible”. How exciting that he has a new, updated version (Volume 1) that I was able to have autographed. Sal is so humble and kind. He really shares his heart and passion about plants, and inspired us to think bigger in the world of aromatherapy to consider new theories in aromatherapy practices, and how we can be better at what we do. Timothy Miller – AromaChemistry in a whole new light: What a gifted teacher. He has a special way of making chemistry not only fun, but comprehendible (even for someone who is not a chemistry buff). We learned about aromatic compounds and how they deliver therapeutic properties for certain health needs. Gabriel Mojay – Constitutional-Spiritual Aromatherapy according to traditional Chinese medicine (TCM): It is always a delight to hear Gabriel talk, especially about using essential oils for the five main TCM organs and their psychological domains. Connecting the dots with TCM philosophies gives great insight about which remedies can help certain health issues. It is one piece to the puzzle of formulating an aromatic plan for overall balance. Remi Clero – Essential Oils Sourcing: Be Distinct or Be Extinct: Remi shared a quite impressive presentation of what goes into being the best supplier of aromatic oils. He walked us through his personal journey, the strict guidelines and practices he has in place, and the importance of an impeccable quality product. I felt like I was a part of the process, from start to finish. Raghda Maksoud – Virtual reality Journey Ancient Egypt to Modern Egypt – From seed to you: I was not able to sit in on Raghda’s presentation but everyone who did, couldn’t say enough about her. I had the luxury of spending some time with Raghda throughout the conference and her spirit and heart are so pure. Valerie Cooksley, RN, OCN, FAAIM, CERT – Partnering with Plants: Cultivating Deeper Healing: Another one of my aromatherapy idol’s I have had the pleasure of knowing for several years. Every time I hear Valerie give a talk, I feel like she is sharing a glimpse into her own personal life’s journey. She is very gifted about movement and development of self, and infusing that into professional practice. Her workshop this year was a journey. It connected right to heart of how we can connect and partner with plants in our gardens, and in our minds. A very restorative class. Kelly Holland Azzaro – Flower Power for Pets(sm)-Exploring the Use of Hydrosols for our Animal Friends: I don’t know if anyone has a bigger heart than Kelly. She is the kindest soul and really, a true animal whisperer. Her knowledge, insight, experience and way of communicating animal needs to us in a way we understand, is remarkable. Kelly shared sooooo much information about using various essential oils, hydrosols and botanicals with animals. Definitely one to keep in the reference library. Dawn Langley-Brady – Essential Oil Studies: Essential oil Substance P Inhibition Study Findings: I was not able to sit in on Dawn’s presentation but everyone who did, loved it. Dawn completed a research study using essential oils and she shared her findings and experience throughout the process. Any nurse or clinical practitioner will want to hear her talk. Shanti Dechen – Harmonized Aromatherapy for Seasonal Wellness: Shanti and I began our aromatherapy journey’s around the same time. She has been a colleague I love to hear from, as her great insight and wisdom is so grounded. She inspired me to be present, aware of my surroundings and current needs. And to match up the aromatic remedies my needs of today. What a beautiful soul! 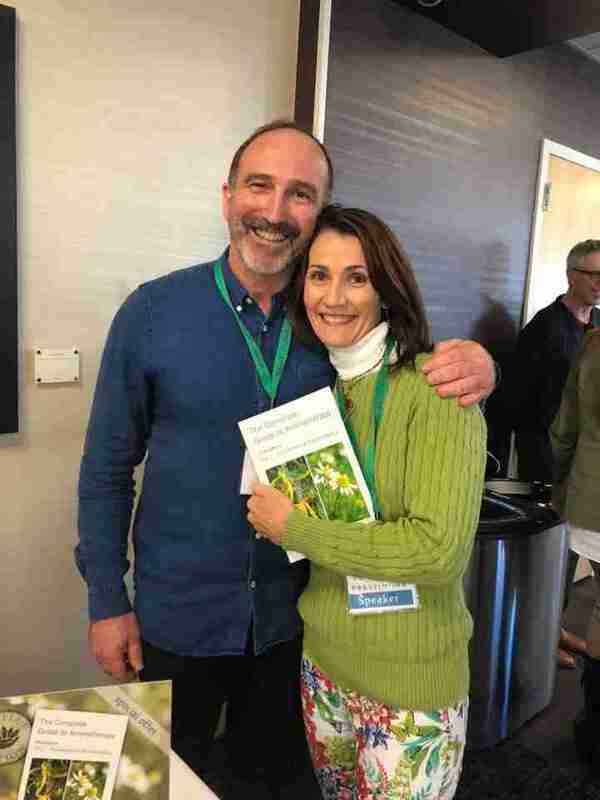 Kelly Ablard – Conservation Consciousness, Clinical Aromatherapy, and Connecting with Spirit; I was not able to sit in on Kelly’s talk about conservation and ecology of consciousness, however I did get to meet her and spend a few minutes getting to know her. She is just pure love and light. Her heart, passion and commitment to conservation pours through her skin and is so inspiring. Every time I think about her, or see a picture of her, I feel her infectious spirit to be the best I can be. Nyssa Hanger – Writing with Aromas: Using Essential Oils in a Writing Practice: I was not able to sit in on Nyssa’s talk, but anyone who knows Nyssa, knows she is a ball of energy and heart. She inspires us to be a part of the process, be aware, kind and connected to create lasting friendships and community. 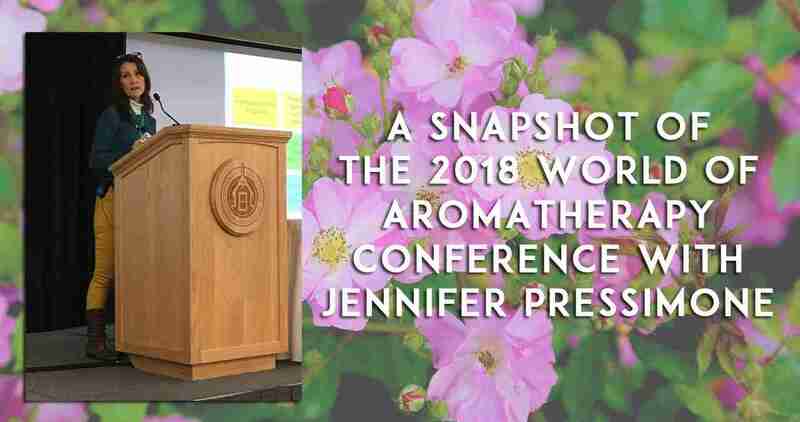 Dr. Jean Bokelmann & Annette Davis, CN, – Clinical Phyto-Aromatherapy: Two brilliant women with brilliant minds sharing insight into the clinical practice, applications and process of integrating aromatherapy and botanicals for women’s health. Every woman needs to hear their talk and you will leave with so many notes of how to take better care of yourself, and what remedies can help you, whatever stage of life you are in (from puberty to PMS, pre-menopause, menopause and post-menopause). Sharon Falsetto – The Healing Garden: The restoration of the Five Senses: What a gorgeous soul. Sharon is such a beautiful person, inside and out. You can help but smile every time you see or hear her. As I listened to her talk, I felt as if I was in her actual garden, smelling each plant, connecting to what that plant has to offer. She shared various ideas for developing our own botanical garden, right in our backyard. And…finally, me. Jennifer Hochell-Pressimone -Aromatherapy for the Gastrointestinal Tract: IBS, Crohn’s, Colitis – I shared my journey of battling Colitis and Crohn’s, to finding my way with solutions, remedies and inspiration. I talked about how the gastrointestinal system works, what happens when its broken, how to determine where it’s broken, and what to do to fix it. We talk remedies, recipes and evidence-based research.